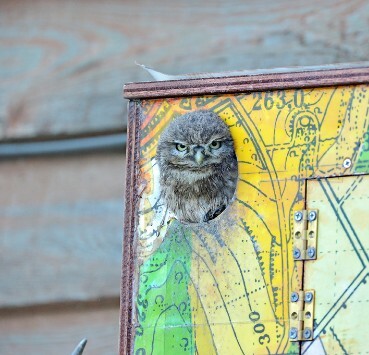 We're monitoring a Little Owl breeding attempt in 2015. Please visit our blog to read the latest news and to watch our Little Owl videos. Little Owls are monogamous, which means pairs remain together for at least one breeding season, and usually until one of the pair dies. Established pairs occupy and defend their territory throughout the year. New pairs form in January; these are usually first year or single birds. Courtship behaviours begin in January and are a wonderful spectacle. The pair become very vocal and make frequent contact calls to each other. Pairs are often seen together and the male provides pre-breeding food gifts to the female. These prey items are important as they help the female to acquire fat resources for breeding. Pairs engage in regular copulation and start inspecting nest sites from February onwards. Little Owls don't build nests; they breed in pre-existing tree hollows, building cavities, stone walls and in nest boxes. Egg laying usually begins in mid-April and the average clutch size is 3 or 4 eggs. Eggs are laid on alternate days and are white with a satin finish. Incubation is carried out by the female, lasts for 29 to 31 days and it begins after the second egg has been laid. Eggs hatch at one day intervals in late May and day old chicks weigh 10 grams. They're covered in white down, their eyes are closed and they need to be kept warm and are fed by their mother. In early June, successful nests contain chicks age seven to 14 days old. One week old chicks have pale grey and fluffy down and their eyes remain closed. The mother broods her chicks and provides small pieces of prey for them to eat. At two weeks old, the chicks can focus their eyes, keep themselves warm, compete for food, walk on their talons and their main feathers start to develop. At this point, both parents hunt to keep up with the increasing food demands. At three weeks old, the chicks are more mobile. 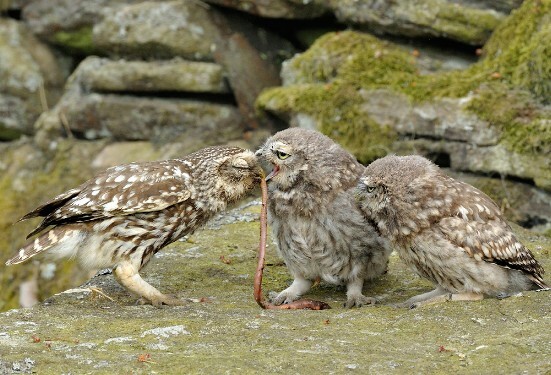 They can handle soft prey items, such as worms, and start to look more like Little Owls. Chicks congregate at the nest entrance and may start to peek outside, but cannot fly yet. Four week old chicks start to branch; this means they clamber along structures which surround their nest,. By early July, the chicks can fly, albeit clumsily, and fledge to roost in nearby trees or buildings. They continue to beg for food and look like a paler and softer version of the adults. They remain close to their natal site until early autumn. This is known as the post-fledging period and the parents help the them to develop their hunting and predator avoidance skills. Most juveniles take their flight of independence in early September; this is the first time they leave their natal territory to become fully independent from their parents. Juvenile Little Owls usually make several flights before they settle in their own territory, which is usually within 10 km distance of their parent's territory. 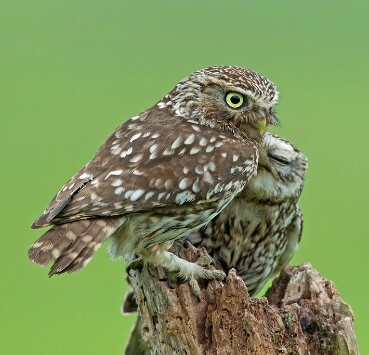 First year Little Owls are vulnerable to predation and starvation when they disperse. If they manage to survive the winter, most will establish a pair and breed in the following year. Courtship behaviours begin in January. 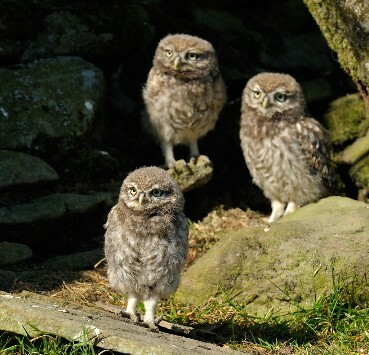 Little Owl chicks start to leave the nest in June. Juveniles stay close to their natal site until Autumn.